The house forms a habitable perimeter around a lush garden courtyard, which offers both openness and privacy. There is a certain quality to the sunlight in Perth. It has an intensity and purity that are distinct – sometimes dazzling, often blinding. I have always suspected that Perth’s reluctance to embrace daylight saving came from a desire to end the hot afternoon light and seek relief in the cool and shadowy evening as soon as possible. This desire for respite from the glaring sunlight of Perth was a key departure point for a house recently completed by MORQ, an architectural practice founded by Matteo Monteduro, Emiliano Roia and Andrea Quagliola, that operates between Rome and Perth. The clients’ request was for spaces that tempered and moderated the harsh Perth sunlight. 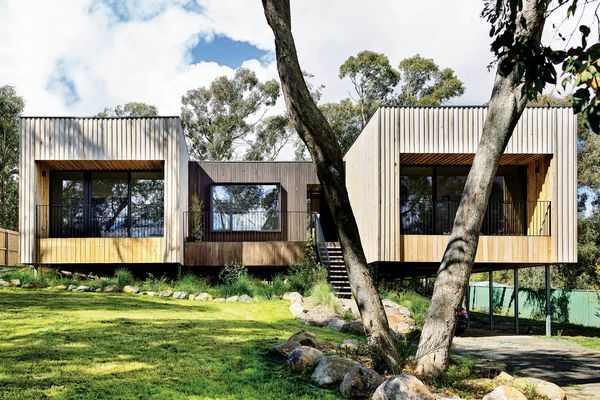 They were seeking a peaceful retreat that had a serene quality – a kind of domestic sanctuary. 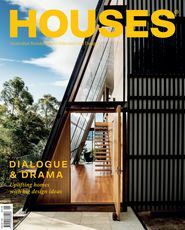 In Cloister House, MORQ has answered this brief with a strong and sophisticated house that challenges suburban orthodoxy. 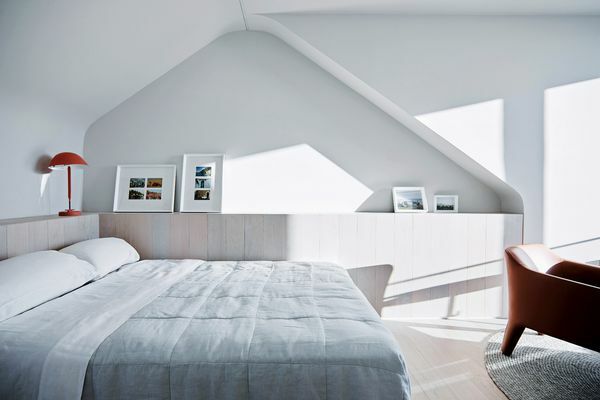 Exposed timber joists and plywood ceilings shift in height throughout the house. The house is located on a subdivided block, fronting a busy road in a suburb close to Perth’s city centre. Its streetscape is composed of a mixture of dual garages, high walls and two-storey commercial buildings. 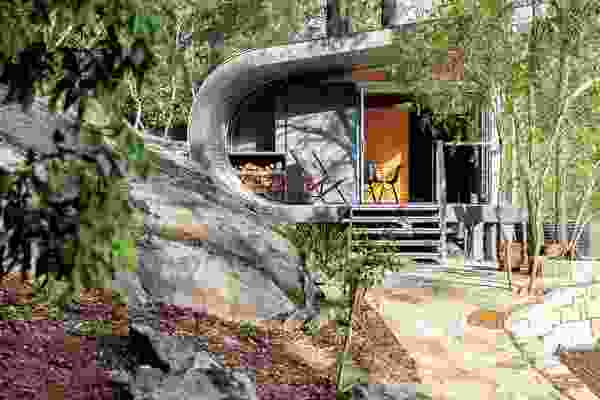 The site has little outlook or aspect and offered few elements that would support the idea of a peaceful retreat. In response, MORQ conceived a house that was a solid enclosure surrounding a central, ordering garden – a courtyard house that not only spoke to the client’s brief, but also resonated with MORQ’s longstanding interest in the courtyard housing of Rome. 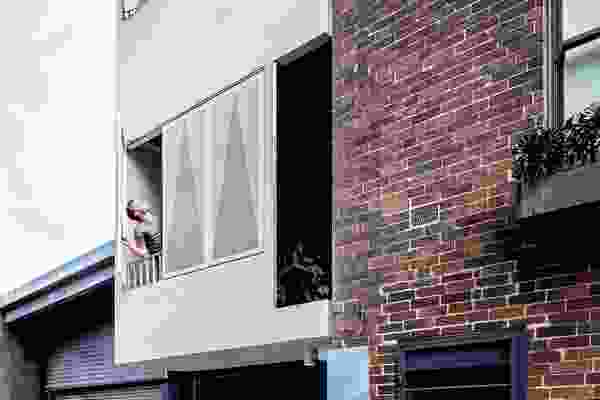 MORQ was also interested in exploring a housing typology that challenged the typical suburban subdivision, where houses have been inflated and block sizes have been reduced, rendering private open space residual and unuseable. For MORQ, the courtyard house was an alternative model that supported the density of the small suburban lot but also provided connection to the garden, nature and a meaningful outdoor space. MORQ co-directors Andrea and Emiliano are both associate professors in architecture at the University of Western Australia, so projects such as this one highlight the connection between academic research and real-world architectural practice. 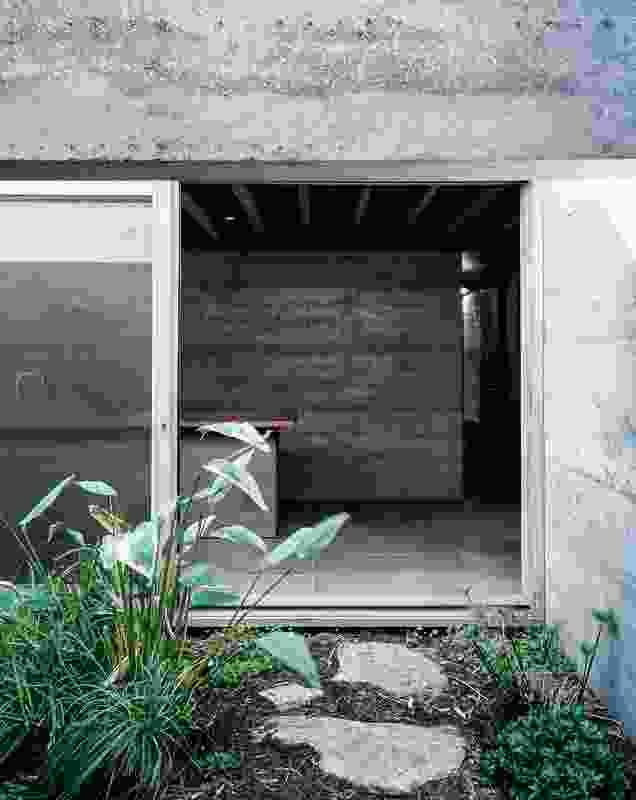 The Cloister House is organized as a sequence of rooms around a central open space, which MORQ describes as a “loop of habitation.” The daily life of a couple and their two adult children unfolds around a lush garden, offering openness to the interior spaces but also privacy and removal from the suburban context. What seems a simple idea in plan is subverted by a number of strategies that create an interior of richness and spatial complexity. 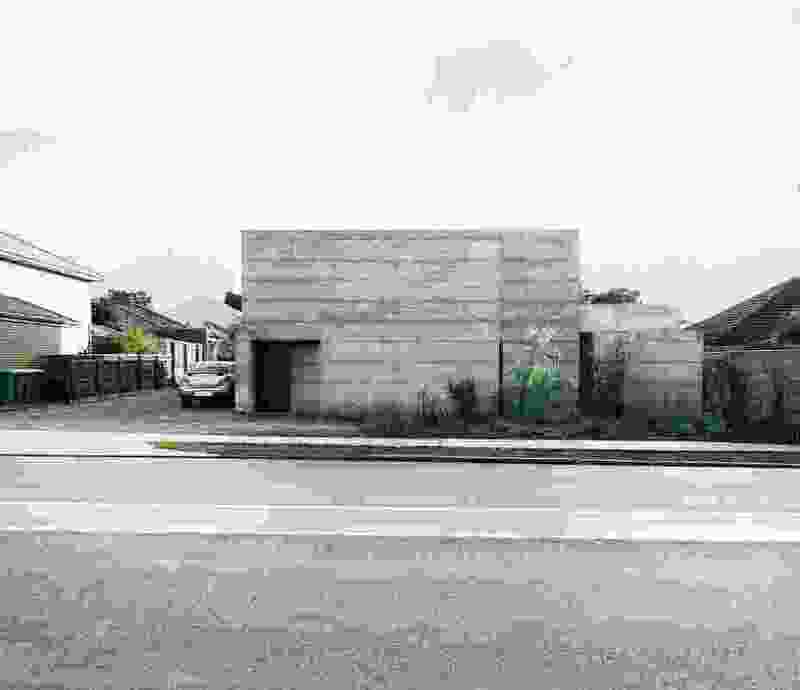 The monolithic form defends against noise and presents a counterpoint to typical suburbia. 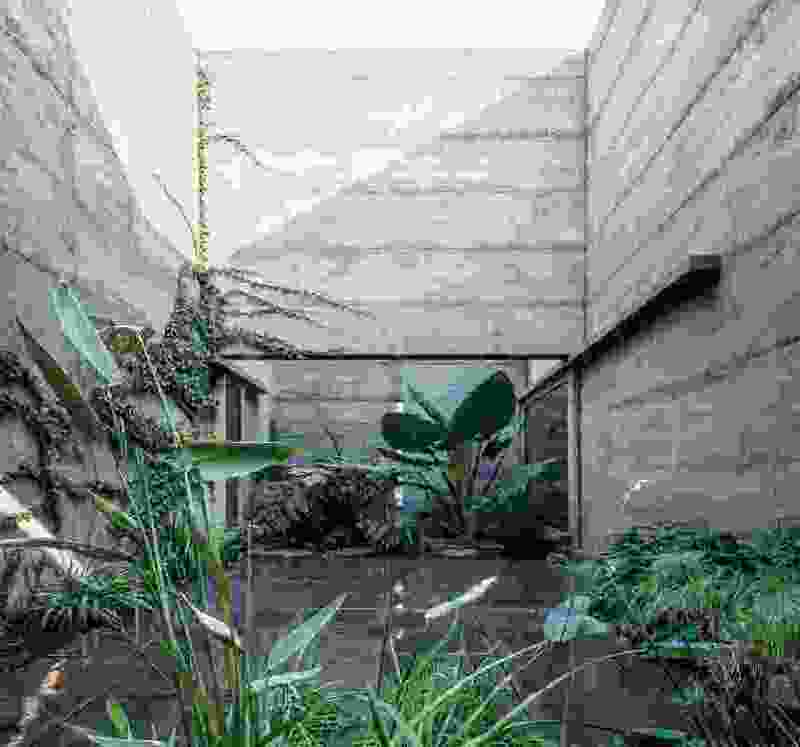 The central courtyard is not a perfect rectangle; a corner slides off to the west, forming a narrow garden between the living room and kitchen. This garden is defined by a wall that hovers overhead, creating a threshold between the kitchen and courtyard and providing the kitchen with a source of soft, reflected northern light. 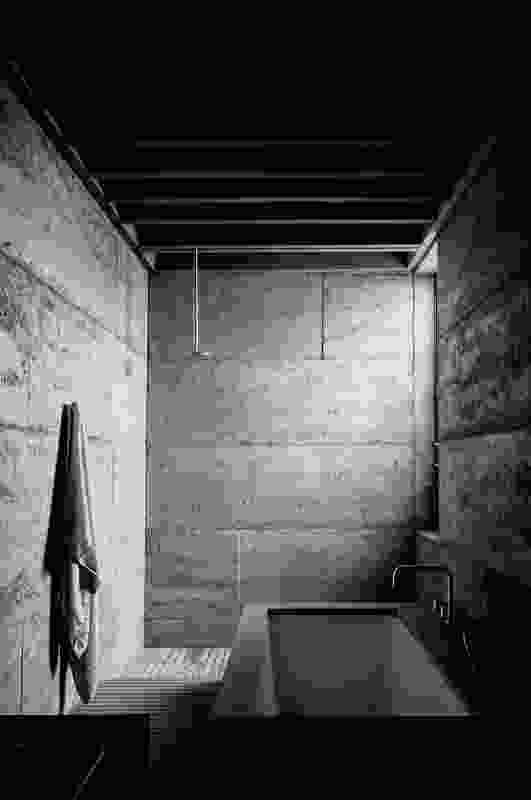 As you move through the public spaces of the house toward the more private, a subtle change of volume occurs. The living and dining rooms, combined as a single space but defined separately by another hovering wall, have ceilings 4.2 metres high. The living room is almost cubic in proportion, providing a particularly pleasing space. More intimate in scale, with a lower ceiling, the kitchen is a long, strongly horizontal space, open on one side to the courtyard. It is also a separate room, unadorned apart from a singular timber benchtop, which gives the space a calm, monastic quality. Sliding glass windows that correspond in position in the living room and kitchen allow the spaces to be directly connected across the narrow garden, subverting the definition of exterior and interior space. The final destination on the loop is the main bedroom, an intimate and cave-like space. Secondary bedrooms are positioned behind the kitchen area and services are located to the rear of the site. The material experience of the house is defined by rammed-concrete walls. These walls are constructed in a similar way to rammed-earth walls; however, they use crushed precast and recycled concrete instead of earth. 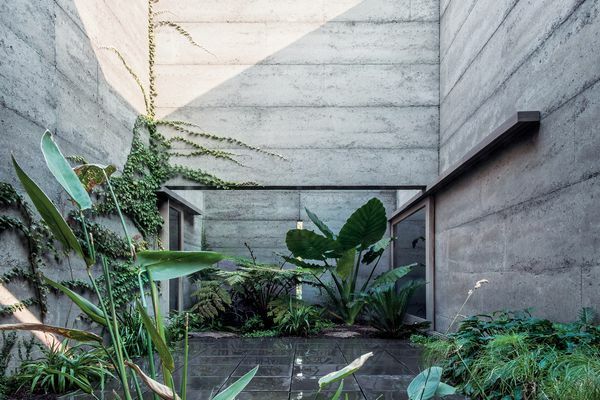 The rammed-concrete walls surround the courtyard and are used for the house’s interior walls. This heightens the sense of ambiguity as to what is exterior and interior space. The thick walls have the immutable qualities of Roman ruins. 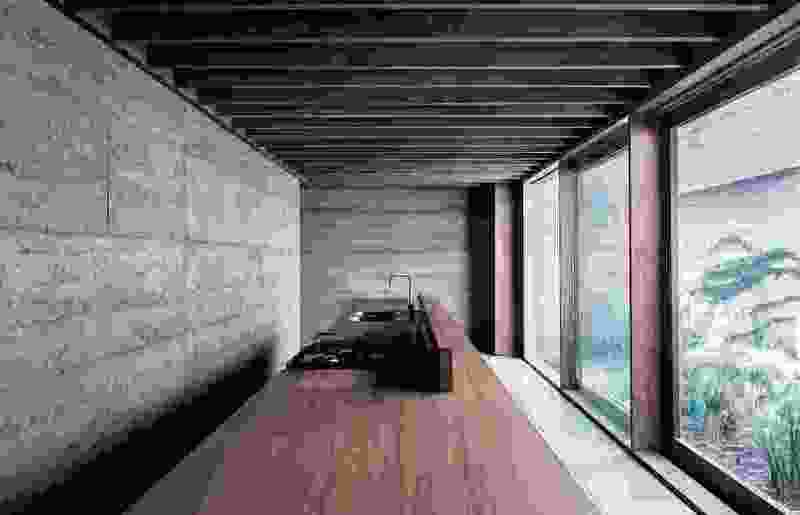 Their thermal mass tempers fluctuations in temperature, creating a comfortable internal environment, while their texture and colour simultaneously absorb and describe light, which seems to graze the surface. This brings a painterly quality to the interior spaces – a kind of chiaroscuro effect. Reflected light is tempered and softened. Sheltered spaces with deliberate openings mitigate the harsh Perth sun. Ceilings are composed of expressed timber joists and raw plywood, lending a warmth to the internal spaces and helping to conceal lighting and services. Floors are precast concrete garden pavers, lightly honed and sealed in the interior spaces. They are an economical choice and provide a material coherency with the rammed-concrete walls. From the street the house appears to be a monolithic rammed-concrete block. A finely detailed steel canopy above a black steel door offers a point of entry, but little else adorns the street elevation. An unstructured garden occupies the setback and this, along with the monolithic form, gives the house an enigmatic quality. Some would find this a challenging house, its blank exterior offering few clues to the rich interior within. However, this would be to overlook a substantial and sophisticated architecture. 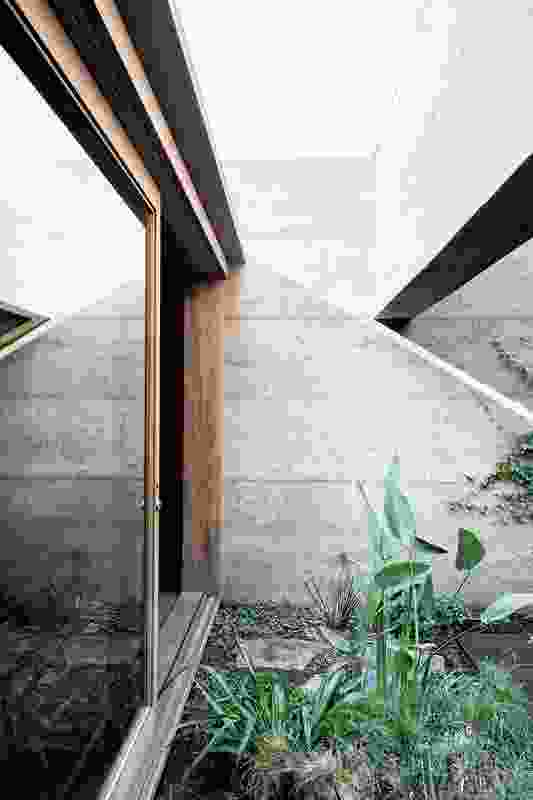 The Cloister House is an excep tional example of a beautifully resolved courtyard house and its typology offers a meaningful alternative to the compressed suburbia that is the prevalent mode of housing in Australian cities. Perth Stabilised Earth rammed recycled concrete. Perth Stabilised Earth rammed recycled concrete; Ecoast Construction rough-sawn hardwood beams and hardwood ply ceiling in pigmented oil. Hardwood internal doors; Steel entry door by Perth Stainless Steel. Concrete pavers from West Slab Paving. Internal and external lighting from Modular Lighting and Partners. Solid hardwood bench and custom hardwood veneer cabinetry by Joondalup Cabinets; Sussex Scala tapware in brushed nickel. Custom rough- sawn hardwood vanity and bath surround by Joondalup Cabinets; Sussex Scala tapware in brushed nickel. Rehau hydronic underfloor heating and cooling. Steel entry canopy by Perth Stainless Steel; Corten steel mesh screen by Rodico Engineering. Custom inbuilt cabinetry throughout by Joondalup Cabinets. 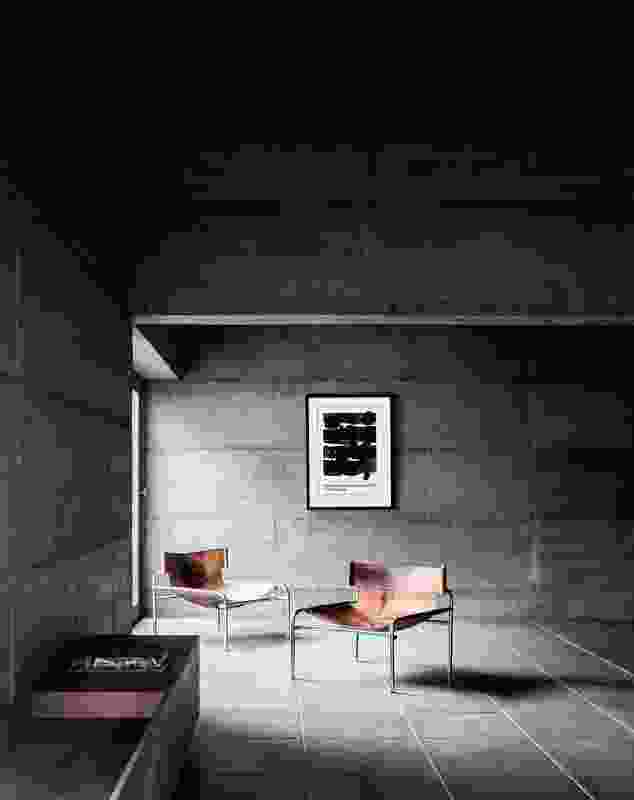 Rammed concrete absorbs light and brings a soft yet textured quality to the walls. 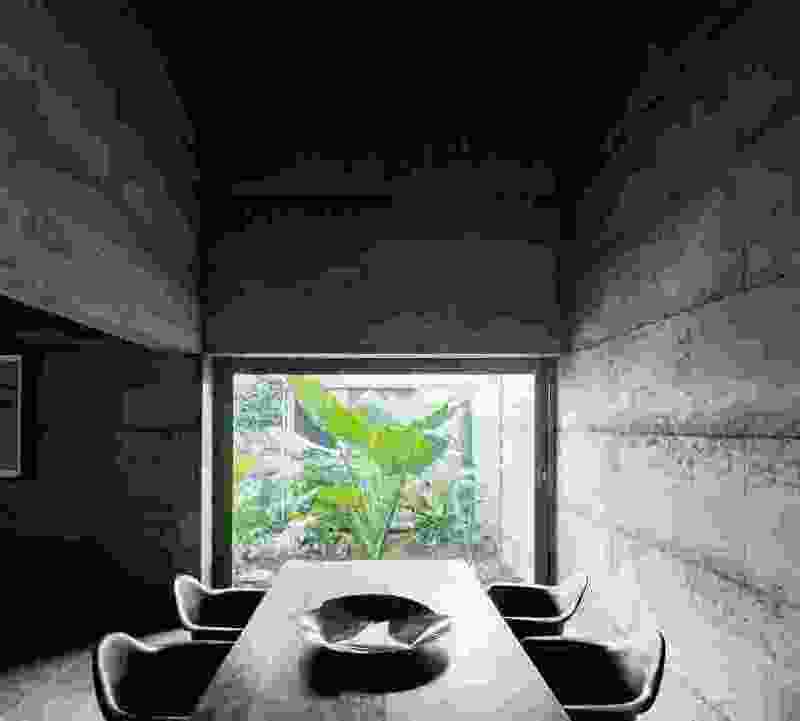 The kitchen looks onto the narrow length of garden that extends from the central courtyard. A hovering wall above the courtyard bounces soft light into the kitchen.